The 8th annual national Ophthalmic Nursing conference venue is within walking distance to the small historic city centre, Cathedral and Castle. Durham has excellent rail links to the UK and there are two airports (Newcastle and Durham Tees) nearby. There is also ample car parking at the venue. 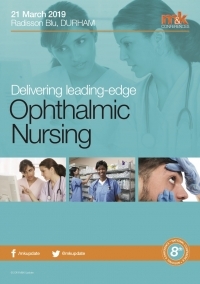 The primary national event for Ophthalmic Nursing and allied professionals working in ophthalmology. What are the features of benign lesions? Adjustable Spectacles: What defines development? Adjustable Focus Eyewear: what is it and where did the idea come from? What can we take from this and could we adapt aspects of the Zambian model here in the UK? Set along the scenic River Wear, the Radisson Blu Hotel, Durham places you in the heart of the charming city centre. Within walking distance of Durham’s many natural and historical attractions, and enjoy idyllic views from your hotel room. If you’re travelling by car, there are major motorways nearby. There are also 2 airports, within a 45-minute drive. Take Junction 62 off the A1(M), and follow the signs to Durham city centre along the A690. After crossing the River Wear, stay in the left-hand lane and turn left at the traffic lights. Take the first immediate left to Framwellgate Waterside. The hotel is on the left.